Okay, I may be exaggerating a bit with that title, but what else can you think when you read that the Treasury will Auction $104 billion in debt next week, an all time record? I guess with the national debt in the U.S. increasing by $3.8 billion per day, we shouldn’t be surprised that the feds want to raise another 27 days worth of spending money, but sheesh, that’s a lot of money, isn’t it? I wonder if that’s why the U.S. dollar has been getting hammered recently? 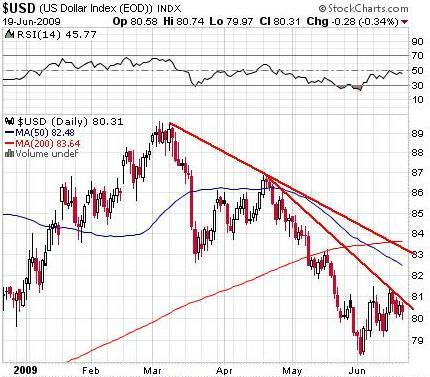 It’s no surprise that countries like China and Russia are getting out of U.S. dollars, since there is no point in investing in a depreciating asset. If I held billions in U.S. dollars I’d be following the same strategy: say some nice things about the U.S., while in the background I’d be liquidating as much as the market can bear. I would use my U.S. dollars to buy hard assets, like companies, real estate, gold, or whatever else I could get my hands on. Speaking of gold companies, if I had to pick one area to put my money in, that would be it. But not immediately. Back on June 6 I explained My Conundrum, and I said that while I expect gold to perform very well in the long term, I also expect the traditional summer weakness to set in. I therefore positioned myself with 80% cash, and 20% in senior gold and silver stocks. I didn’t sell everything, because in these volatile times a sudden unexpected event could send gold soaring, and I want to be protected. For added insurance, I sold calls against the gold and silver stocks I owned. Exactly as expected, in the last two weeks every one of those gold and silver stocks fell. Since I sold at or in the money call options, when the stocks fell the options lost their value, and today they all expired worthless. I therefore get to keep the premiums on all of the calls, which reduces my losses on the stocks. Yes, I could have simply sold the stocks and then I would have no losses, but long term I will be buying these stocks, and I can’t pick the bottom, so this middle of the road strategy made perfect sense. I’m not sure if that’s a real term or not, but here’s how it works, using AEM.TO – Agnico-Eagle Mines Ltd. as an example. Agnico-Eagle closed on Friday at $59.98. In the last year it’s been as high as $78.79 (on July 14, 2008), and as low as $27.50 (on October 27, 2008). As an aside, that means that last year, from the summer peak to the fall crash, Agnico-Eagle lost 65% of it’s value. Of course that also means that from the bottom until today AEM has more than doubled in value. That’s volatility. If the price crashes to last October’s lows, I end up owning the 1,000 shares I want. Obviously I fully expect a drop below $55, so I’m only buying 100 shares at the $55 level, just in case I’m wrong. I’m happy to own them at $45, and at $35 it’s a great buy, so I’ll buy even more shares at that level. If another crash happens, I get even more shares at a bargain price. What if I’m wrong and the share price starts going up on Monday, and never looks back? I guess I won’t buy any shares, but I don’t think that’s likely to happen. There are of course two other strategies I could employ to build my portfolio. I could repeat what I did in June: By the stocks, and then do covered writes against them. Again, assuming I own 200 shares of AEM that are currently trading at about $60, I could sell 2 contracts for the July 60 call option at $3.15 (you can get full quotes on Canadian options here). If AEM increases between now and July 17, I am forced to sell my shares at $60, but I pocket the $3.15 premium, so in effect I have sold my shares at $63.15, a 5% profit in less than a month. If they stay flat or fall, I have lowered my cost basis by $3.15, which gives me cash to buy more shares at an even lower price in July. As an aside, as Peter518 pointed out on the Forum, a better strategy is to sell the options on the U.S. markets (for interlisted stocks), since the premiums are lower and the volume is higher, making for tighter spreads and faster executions. That’s true, and if I lived in the U.S. that’s what I’d be doing. However, as a Canadian, and given my negative outlook on the U.S. dollar, I prefer to limit my currency risk by staying with the Canadian options. The final strategy, if I expect the price to drop, would be to sell puts. A call option gives me the right, but not the obligation, to buy a stock at a set price before a set date. A put is the opposite; I can sell a stock at a set price before a set date. If I sell the put or the call, it’s the opposite. 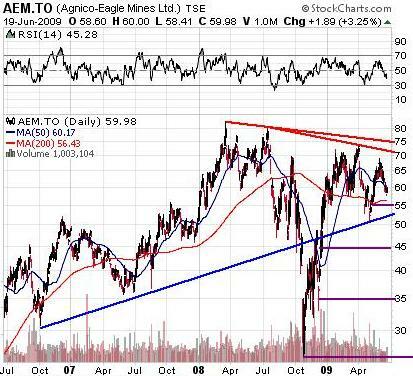 I want to buy AEM.TO – Agnico-Eagle Mines Ltd. at $56. Today it’s at $60, so I sell a July 56 put for $1.65. If the price of AEM is below $56 on July 17 when the option expires, the holder of the option will “put” the stock to me, and I will have to buy it from them for $56. That’s fine, because I was going to place a stink bid at $56 anyway. (Actually I wanted to place a stink bid at $55, but these options trade in $2 increments). I pay the $56, but I already had $1.65 in my pocket, so it really only cost me $54.35. If AEM goes up, the puts expire worthless and I keep the premium. If AEM crashes I shouldn’t have sold the puts in the first place, since I could now buy the stock for even less, but if I was going to place stink bids anyway, there’s no difference; that’s what I would have paid, with our without the puts. The only problem with the put strategy is that there are margin requirements. You need some cash, or stock, in your account before you can start selling naked puts, so if I only own 200 shares, I can’t sell puts for 800 shares, unless I have the cash or other security to back up the potential loss. I’m not sure yet. I’ll do some number crunching and decide. On the surface, it would appear that taking in $3.15 on a covered call, at the money, is better than taking in $1.65 on a put that’s $4 out of the money. But, it depends on the price of the stock at options expiry. If AEM is $56 on July 17 and I sold calls, my call options are worthless, so I make $3.15, and I own a stock worth $56. If AEM is $56 on July 17 and I sold puts, the put options are in the money, and I’m required to pay $56 to buy the stock, so I own a stock worth $56, and I have $1.65 in my pocket from the premium on the put. Conceptually the call strategy is easier to understand, so that’s probably what I will do. I prefer to do the covered writing with two or three weeks left until expiry, not a full month, since the premiums are still relatively high (there has been less erosion) and yet I’m only risking two or three weeks of movement. The perfect time to do the covered write is after a nice two or three day run up. I get great premiums, and it’s more likely a drop will be coming soon, since nothing rises forever. SSO.TO – Silver Standard Resources, Inc. I will eventually have 30% of the portfolio in junior stocks like the ones on the above list, and some others, 60% in the senior stocks, and a further 10% in whatever else appeals to me. Some of that 10% may eventually go into uraniums, or Rare Earth stocks that Dines is hyping at the moment, but for now they are so thinly traded that there is no point in putting any money into them at this point. I’ll wait for the inevitable correction this summer, and then consider my strategy. So, to summarize: I expect weakness this summer, so I will scalp a few points using a conservative options strategy, I will start buying on dips (which I don’t expect to really start until July or August), and I will position myself for a great fall season. Happy Father’s Day, and as always feel free to post your thoughts on the Buy High Sell Higher Forum. See you next week.